GraphPad is an entirely new way for contractors to complete their estimates and proposals. With the best dimensional drawing engine on the iPad, GraphPad allows users to create accurate scale drawings quickly and with little or no training. Your salesmen no longer need to login to their PC’s to create their drawings. They can do it right on the iPad, during their initial visit to the site. GraphPad was designed from the ground up to be part of an integrated system to help contractors in the field. While it has probably the best 2D dimensional drawing engine available on the iPad, its so much more! GraphPad provides a seamless integration between your business forms and its 2D dimensional drawing engine. With GraphPad, you don't create a drawing than copy it to the appropriate form, you draw directly inside the form itself. You can then email it directly to your customer, coping it to your office. Integrate GraphPad with your existing system via a Map View displaying your users appointments. Opening one of your standard forms pre-populates all your customer data! GraphPad can be configured with all your standard symbols which are displayed for easy access while creating your drawing. Adding a symbol also automatically updates any tables you have configured, so you can generate a bill of materials while creating your drawing! Developing a mobile solution can be incredibly expensive, and there's no guarantee the results will meet your user's expectations. GraphPad Pro is currently available in the App Store, so you can see exactly how your solution will work even before you start your project! GraphPad can be configured with fixed form fields, drop down lists, check boxes and images to exactly replicate your existing forms. GraphPad supports multipage forms and is designed from the ground up to work with the iPad, so lists are always displayed on the right side for easy selection, and signature fields are sized to make it easy for customers to sign. Custom libraries may consist of images, symbols, geometry and text and can be distributed to all your users via an email attachment or weblink. Libraries can be organized as desired, and remain open while the user is completing his drawing so he can easily place the symbols as needed. GraphPad can be integrated with your backend systems via a MapView or Custom Development. The MapView allows users to see not only their appointments, but all the appointments for the day allowing them to quickly adjust if another estimator is running behind or a new customer calls in while they are still in the field. There are numerous examples of how GraphPad can be integrated into your business process. Take, for example, the Home Depot Kitchen Design Process. 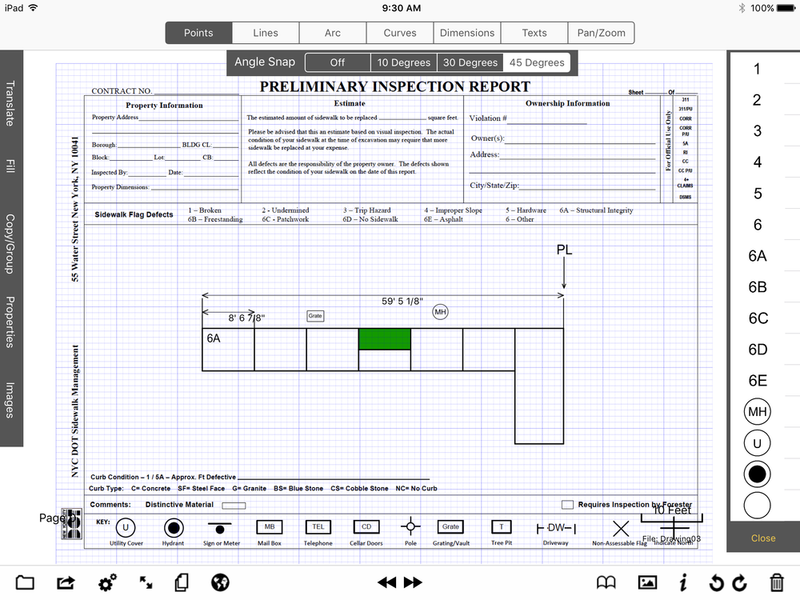 Just adding the Kitchen Design Packet into GraphPad means that their estimators can complete the forms on the iPad during their inspection and send them immediately back to the office for review; but there’s also the potential to completely transform the process. By adding a product library with actual pricing, estimators would be able to up sell features and do price comparisons while at the customer’s home. For some businesses this might mean they could close sales before their competition even has a chance to make a customer visit - not only decreasing costs, but increasing sales as well! Examples from the Home Depot - Kitchen Design Packet created for Metropolitan Renovations. The City of New York started using Galaxy tablets running Visio in order to complete their inspection drawings, but found the process was too cumbersome. Switching to GraphPad reduced the time to create their inspection forms by 40% and there was a 100% acceptance rate among the inspectors for using GraphPad over completing the inspection forms by hand. Having the ability to immediately send completed forms to both the business owner and their backend system dramatically reduced the time from when the problem was reported to when a citation was produced, reducing the City of New York's liability.